A Dallas-based taco shop looked North when deciding to open up its newest franchise. 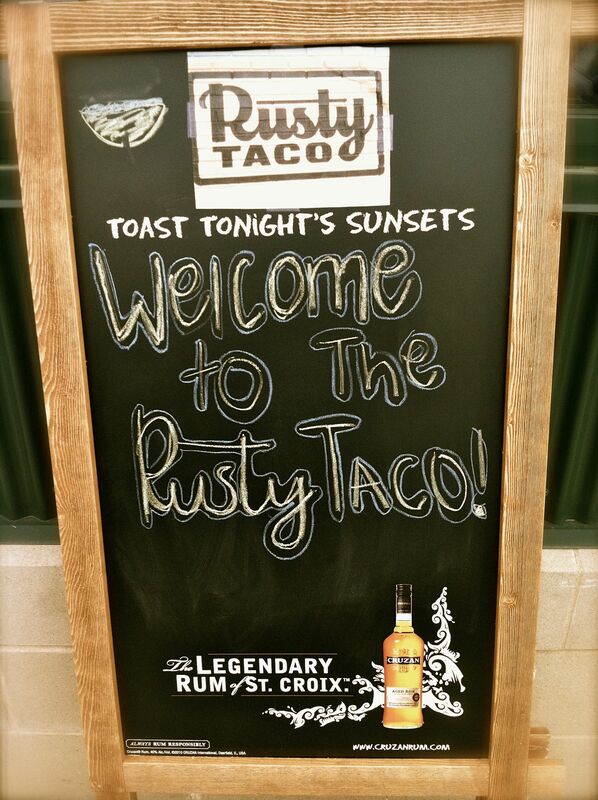 Rusty Taco, named after its co-founder, Rusty Fenton, debuts in Saint Paul, Minnesota on Tuesday, April 5. Open for breakfast, lunch and dinner, Rusty Taco is sure to draw a crowd from the Saint Paul/Highland Park neighborhood, right across the parking lot from Trader Joe’s on Lexington Parkway, at the 35E and Randolph Avenue interchange. Rusty and some of his Dallas crew were in Minnesota this weekend, and I got to sample the tongue-tingling delights at a private opening. As I have mentioned in previous posts, I am a strict vegetarian, but Rusty Taco has one taco for me – the Rajas. The “meat” is grilled poblano, mushrooms, onions, red pepper, cilantro and queso fresco cheese, which I skipped. I liked the smokey, grilled flavor and how the mushrooms were used as the dominant ingredient. Husband is a big fan of the Rusty Taco, filled with achiote pork, pineapple, onion and cilantro. He also enjoyed both brisket offerings, slow roasted and served with onions, or with BBQ sauce and slaw. I also heard several people comment about how good the Baja Shrimp Taco was. In addition to the Rajas, I made the mistake of diving into a side of chips and salsa, pretty much inhaling the entire thing. The chips are warm and thick, fried to perfection, and the salsa is red tomato fresh, with a slight kick. While I took down the chips and sauce, my table mates devoured chips and guacamole, saying it was excellent. D Magazine named Rusty Taco one of the top breakfast taco joints in all of Dallas, and Minnesotans will get to enjoy the same fare. There are 11 tacos on the menu, and they are all $2.50, including the four breakfast tacos. If you run out of chips before you run out of salsa, the staff will gladly refill your basket. If you have little eaters who do not like tacos, Rusty Taco will make a cheese quesadilla for the kids. The guacamole is made fresh in the restaurant. Mexican sodas and Mexican Coca-Cola are available, and beer is on tap for $3, featuring Minneapolis brewery, Fulton Beer. Bottled beer is $3.50, and big cans are $4. Rusty Taco will cater your event, with a minimum 40 taco order. Opening this Tuesday at 7 a.m. This entry was posted in Travel and tagged Breakfast Tacos, D Magazine, Dallas, Facebook, Fulton Beer, Rusty Taco, Saint Paul. Bookmark the permalink.